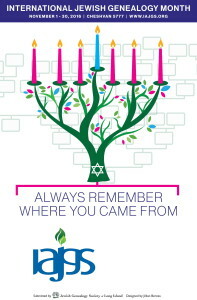 New Associate Member: JewishGen.org IAJGS is pleased to welcome JewishGen.org as its newest Associate Member. New Member: Jewish Genealogy & History Society of South Australia IAJGS welcomes the Jewish Genealogy & History Society of South Australia as its newest member. For more information about the Adelaide group, please contact Margot Bailey (kwbailey@optusnet.com.au). New Member: Jewish Genealogy Society of Central Maryland IAJGS welcomes the Jewish Genealogy Society of Central Maryland as its newest member. For more information, visit the society’s Facebook Group. Salute! to Rosemary Eshel IAJGS Salutes Rosemary Eshel of the Israel Genealogy Research Association (IGRA). Read more about what Rosemary does. Two New Members IAJGS welcomes two new member societies: Miami Valley Jewish Genealogical and Historical Society (a successor group to the former JGS Dayton in Ohio) and Sociedade Genealógica Judaica São Paulo in Brazil.